The National Center on Accessibility is a global leader promoting the full inclusion of people with disabilities in parks, recreation and tourism. Based at Indiana University and established in 1992 through a cooperative agreement with the National Park Service, NCA has emerged as a leading authority on access issues unique to park and recreation programs and facilities. NCA promotes the principles of universal design and inclusion as important factors for achieving personal wellness and building healthy communities. Through the comprehensive services of Research, Technical Assistance and Education, NCA focuses on universal design and practical accessibility solutions creating inclusive recreation opportunities for people of all abilities. NCA links the preferences and needs of people with disabilities to those of practitioners designing facilities and planning programs. NCA services give park and recreation professionals practical accessibility solutions to implement in their programs and facilities, welcoming and encouraging leisure participation among people with disabilities. Created in 1991, the Kennedy Center's Accessibility Office oversees architectural, communications, and program access at the Center for all programs and events. Going beyond compliance, the Office strives to make the Kennedy Center a performing arts center for everyone by initiating opportunities for patrons, visitors, employees, volunteers, artists, performers, and interns with disabilities; promoting the use of Universal Design in all renovations for full physical access; and providing assistive listening devices, sign language interpreters, captioning, audio description, and Braille and large print programs for events and activities at the Center. Additionally, the Accessibility Office encourages and promotes accessibility in cultural arts venues around the nation and across the globe through the Center's annual Leadership Exchange in Arts and Disability (LEAD) conference. The Kennedy Center's Leadership Exchange in Arts and Disability (LEAD) network is a professional network that engages cultural administrators in a conversation on accessibility, disability, and inclusion in the arts. Through its annual conference and ongoing professional development initiatives, LEAD explores practical methods for implementing accessibility in cultural environments; communicates information about arts and accessibility; and shares resources and knowledge among professionals in the field of accessibility. VSA, an international organization on arts and disability, was founded in 1974 by Ambassador Jean Kennedy Smith to provide arts and education opportunities for people living with disabilities and increase access to the arts. With a network of international and United States affiliates, VSA provides resources and tools to support arts programming in schools and communities; arts and education programming for youth and adults living with disabilities around the world; and other opportunities for learning through, participating in, and enjoying the arts. VSA is an affiliate of the John F. Kennedy Center for the Performing Arts. The Smithsonian’s Accessibility Program strives to make all visitors feel welcome by providing consistent, effortless access to the Institution’s programs, collections, and facilities. This program, which serves as a role model for museums throughout this country and around the world, is founded on the belief that all Smithsonian visitors and staff are valued, and that access should be integrated, independent, and dignified. As part of its mission, the Smithsonian Accessibility Program seeks to expand its national outreach to the museum community, diffusing resources, technical information, policies and practices, and replicable programs. Founded in 1846, the Smithsonian is the world's largest museum and research complex, consisting of 19 museums and galleries, the National Zoological Park and nine research facilities. 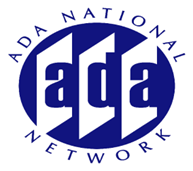 The Great Lakes ADA Center is a member of the ADA National Network.The Center and Network's mission is to increase awareness and knowledge with the ultimate goal of achieving voluntary compliance with the Americans with Disabilities Act. The Great Lakes ADA Center is one of 10 Centers that comprise the Network serving the states of Illinois, Indiana, Michigan, Minnesota, Ohio, and Wisconsin. The Great Lakes ADA Center is a program of theDepartment of Disability and Human Development under the College of Applied Health Sciences at the University of Illinois at Chicago.